The spread is the difference between the bid and the ask price, the gap between the prices at which you go long or short on a particular market. If you are offered a spread on the UK 100 Index of 6017/6019, that 2-point gap separates the price above which you will profit from a rise if you go long from the one below which you will profit from a fall if you go short. Go long, and you will profit from every point that the UK 100 reaches above 6,019. Go short, and you will profit from every point that it falls below 6,017. If ABC Spread betting company is offering a spread of 2646/2653 on Microsoft Corp, and you expect it to rise, you could go long on Microsoft Corp at, say, £2 per point, at the 2653 price. If Microsoft Corp rises to 3153, you will have made £1000. If it falls to 2153, you will have lost £1000. On the other hand, you may be pessimistic about the outlook for Microsoft Corp, in which case you could go short at £2 per point, at the 2646 price. If Microsoft Corp falls to 2146, you will have made £1000, but if it rises to 3146, you will have lost £1000. Alternatively, you can open a quarterly bet, which can still be rolled over or closed prior to termination, but which will otherwise terminate at the end of a specific three-month period. Just as with daily rolling bets, quarterly bets can be either long or short, and the same principles apply. ABC Spread betting company is offering a quarterly spread of 2644/2664 on Microsoft Corp, and you expect it to rise, you go long on Microsoft Corp at, say, £2 per point, at the 2664 price. Three months later Microsoft Corp rises to 3164 and you exit, you have made £1000. If it had fallen to 2164, you would have lost £1000. On the other hand, you may be pessimistic about the outlook for Microsoft Corp, in which case you could have gone short at £2 per point, at the 2644 price. If Microsoft Corp falls to 2144 after two months, you will have made £1000, but if it rises to 3144, you will have lost £1000. Quarterly spread bets do not incur overnight financing charges – the cost of holding the position is built into the spread. 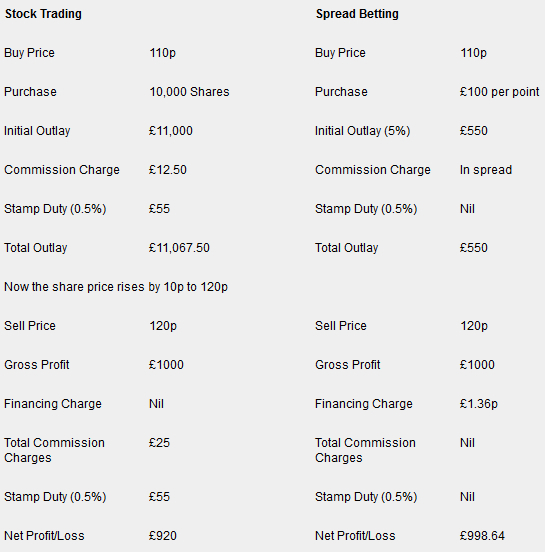 Compare the cost of buying 10,000 shares compared to the equivalent spread bet of £100 per point. So using a spread bet, you are able to make £78.64 extra profit compared to an equivalent share trade.